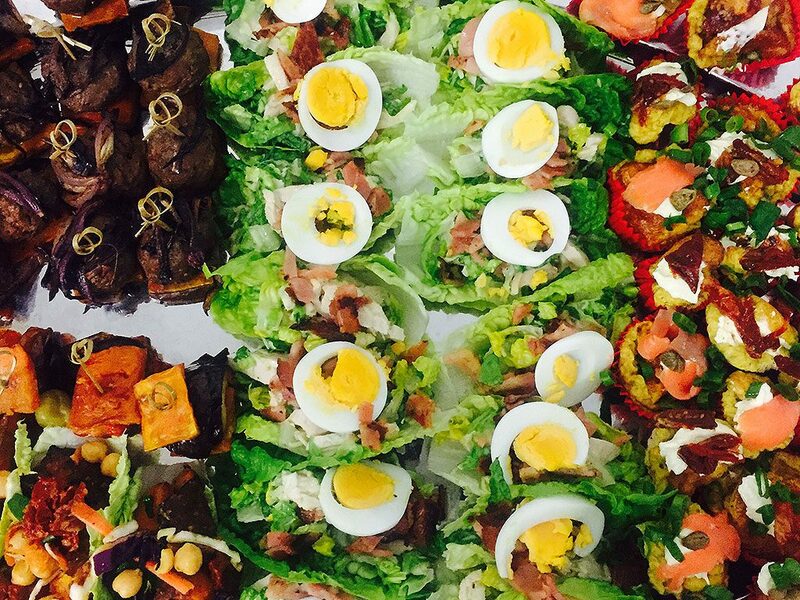 Pleased to offer the below selection of gourmet platters. Prices are calculated on a per person rate, with a minimum of ten (10) people for catering purposes. 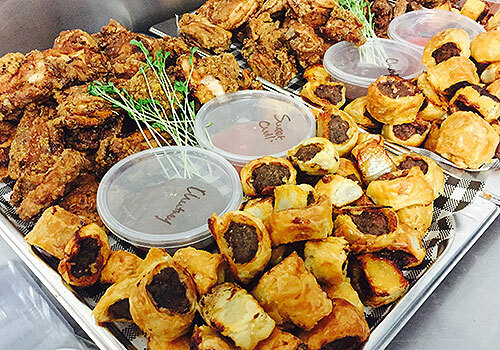 You can also add some additional items at extra cost including: fried chicken ($4pp), sausage rolls or mini-pies ($3.50pp or both for $5pp) and serviette, plastic plates / bowls (50c pp). Platters can be collected or delivered around Cairns city for $30. Download catering information. 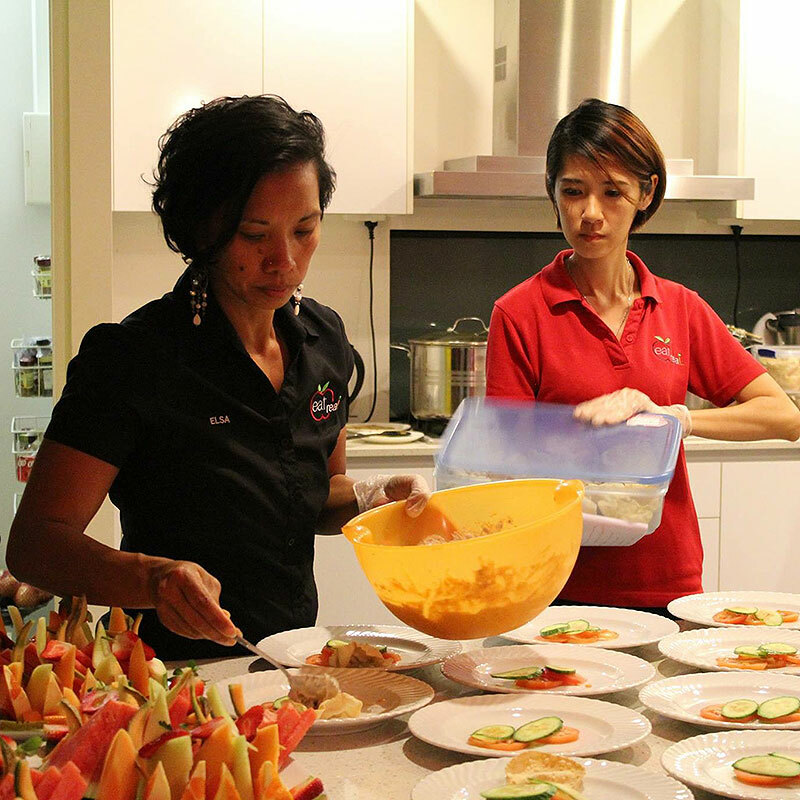 Catering to all diets and requirements, including gluten free, dairy free and vegan. 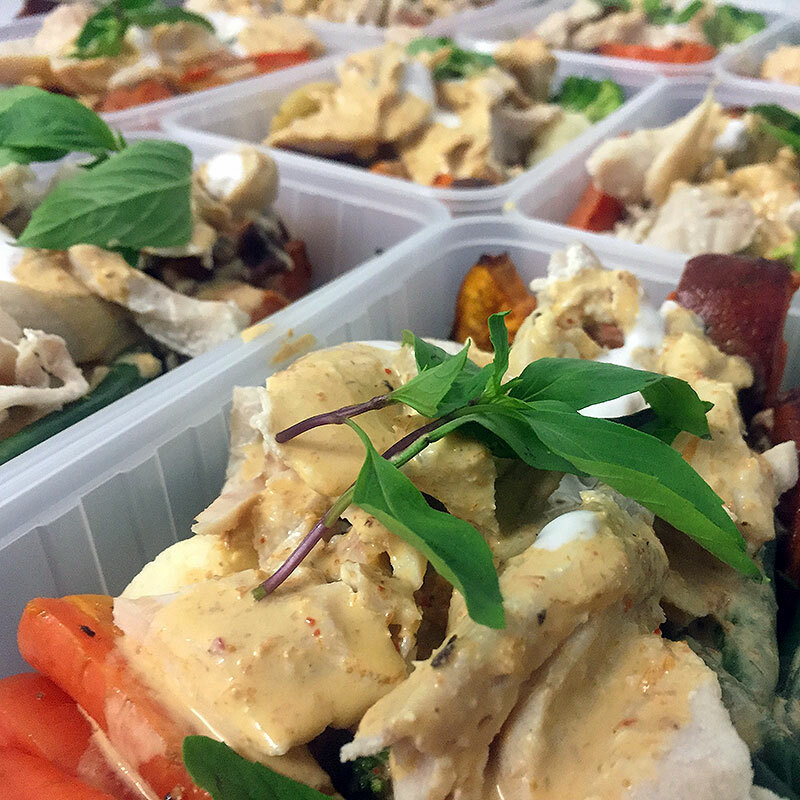 Fillings prepared fresh, using local produce wherever possible. 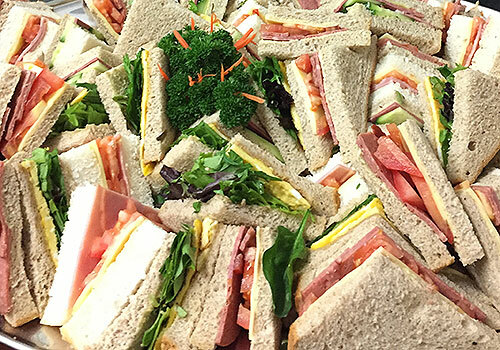 Made fresh for your function and/or meeting. 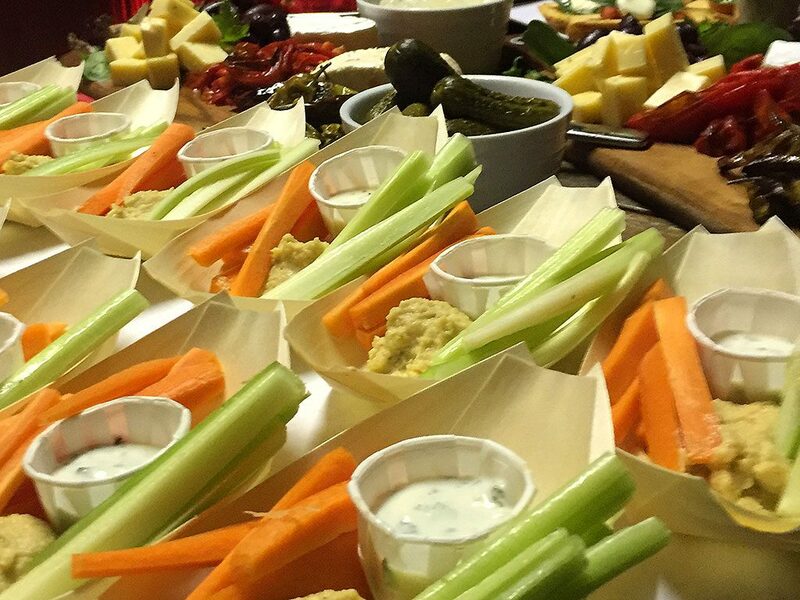 Can cater to a range of dietary requirements, including vegan, gluten and dairy free. Good to look at and eat. 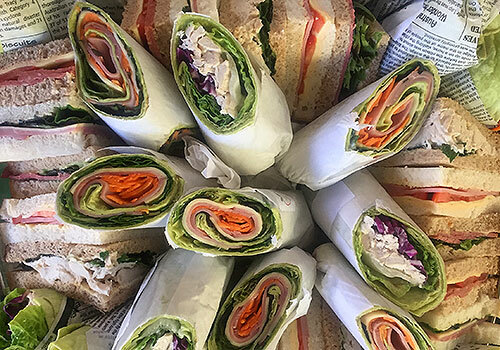 Beautifully presented, individually prepared mini-wraps and sandwiches. 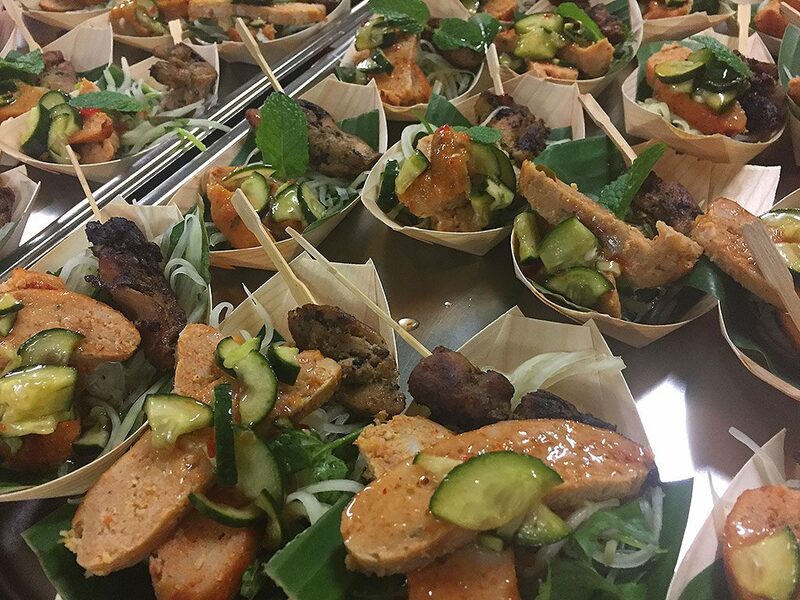 Can cater to a range of dietary requirements, including vegan, gluten and dairy free. Everyone’s favourite! Hand-made sausage rolls and mini-pies, served warm with sauce. Perfect for all occaisions, corporate or casual. Fresh ingredients, crafted with care. Choose from 2 x savoury and 2 x sweets. 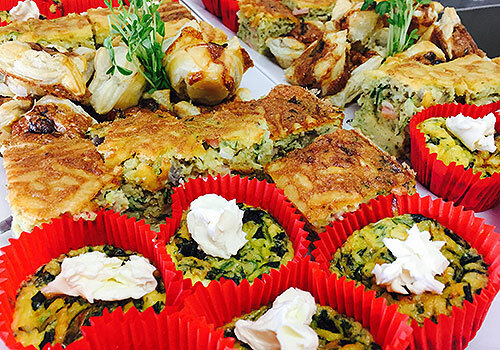 Sausage roll, mini pie, zuchini slice, assorted quiche, ham and cheese criossant. Sweets: muffins, cakes, slices and fruits. 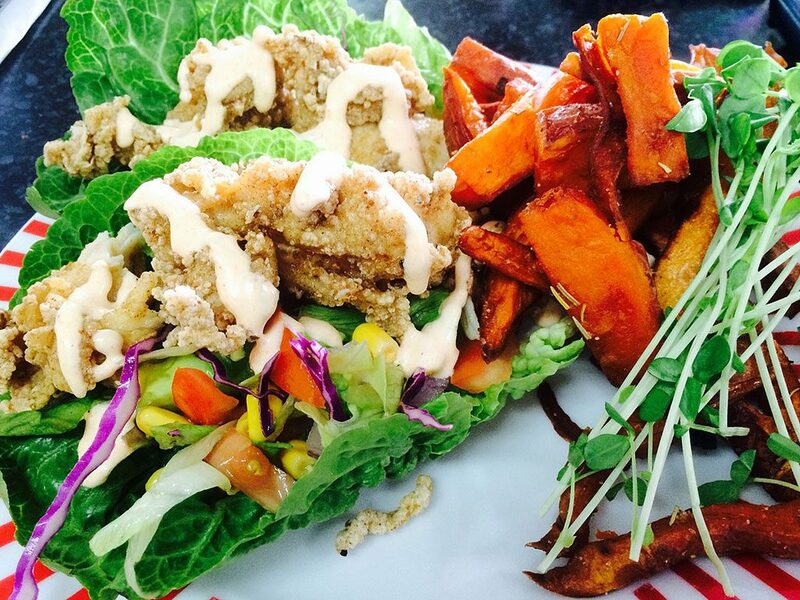 Fresh, healthy and delicious. 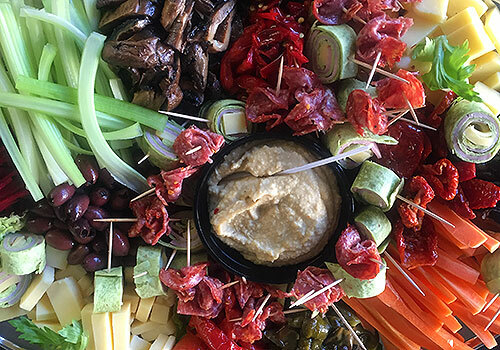 Includes cold meats, mixed grilled vegetables, olives, sundried tomato, vege sticks, homemade dips, crackers and cheese. 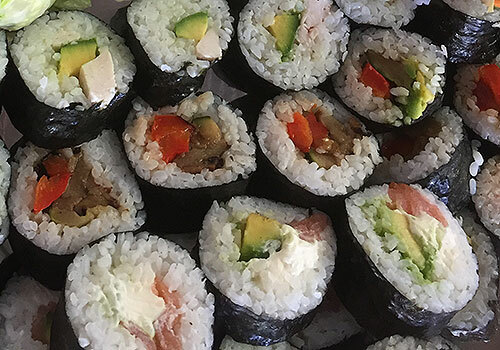 Homemade sushi rolls to suit your diet and tastebuds. Quality, fresh ingredients including avocado, cucumber, chicken, beef and more. Dipping sauce include. 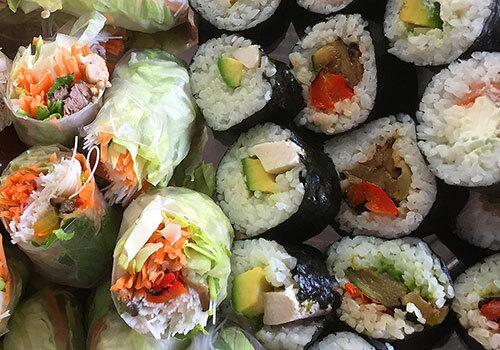 A combination of homemade sushi rolls and rice paper rolls. Fresh and delicious. 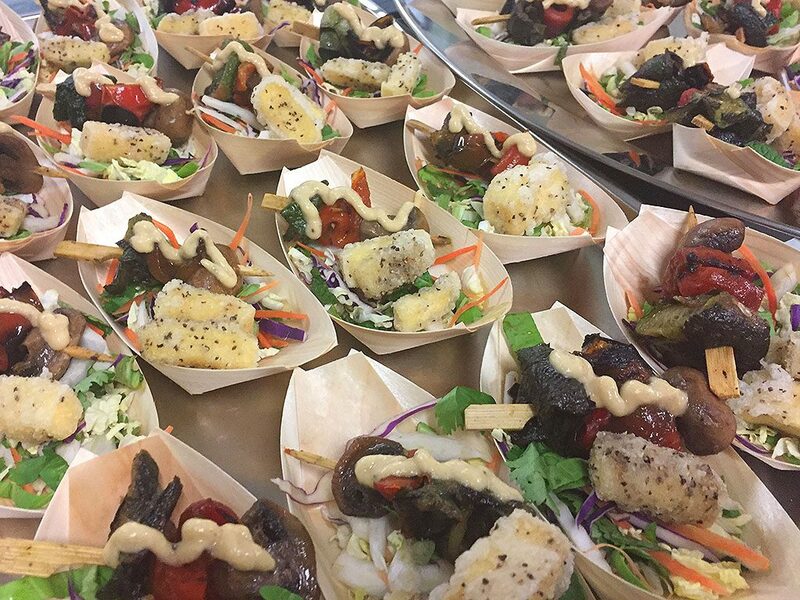 Can cater to dairy free, gluten free and vegans. Comes with dipping sauce. 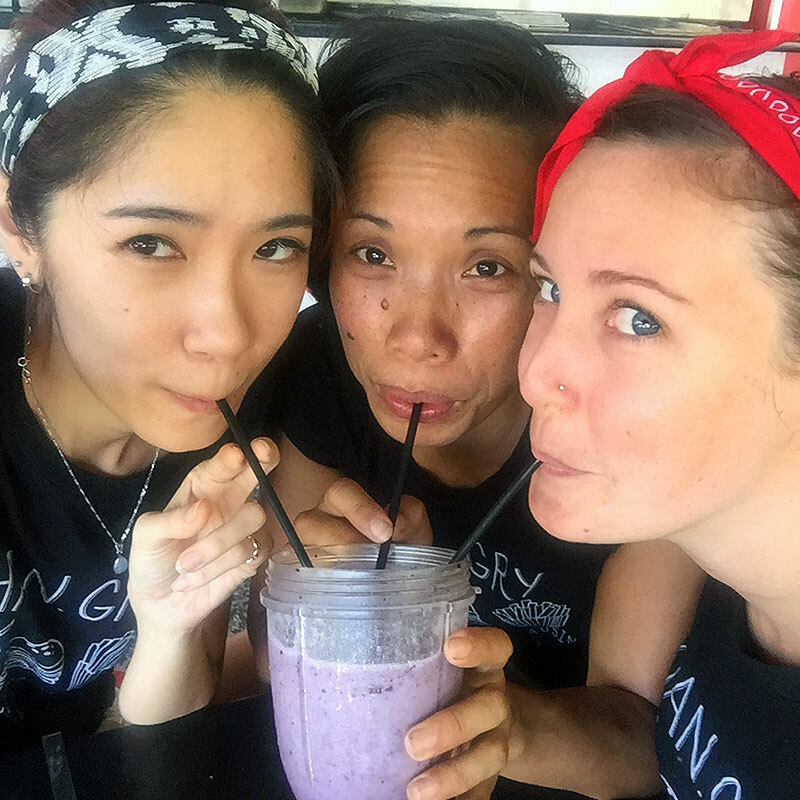 "I can't speak highly enough about the girls (and the food!) 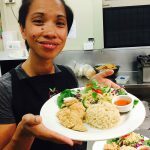 from Eat Real Cairns. Not only are these two of the most genuine people I have ever met, but their food is the sort of thing dreams are made of. 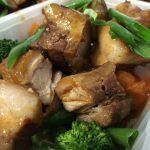 We didn't want a carbon copy menu from any old catering company but we also didn't have the budget for silver spoon service. One meeting with these ladies and they totally got what we were after and the feel of our wedding. "If it was your last day on earth, what would you want to eat?" This is how our catering discussion started. Seriously, if their food was the last thing I had gotten to eat on this earth, I'd be pretty happy! My only complaint from this incredible feast they provided in the rain forest, was that being the bride I didn't get nearly enough time to eat it!! I loved the fact that everyone was completely blown away by the first three dishes that were served and this was only the entree!! By the time the mains all came out it was ridiculously extravagant. They listened to what we wanted and took it to a whole other level. If you have any reservations about using this company, please feel free to message me. 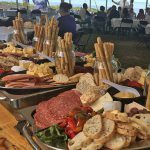 They are amazing humans, and incredible caterers!! (I may be reliving the green Thai chicken curry a little right now.... wow!) Thank you, thank you, thank you! If I ever ditch this new husband of mine and get married again (no immediate plans, as I kinda like him!) then I'll be using these girls! " 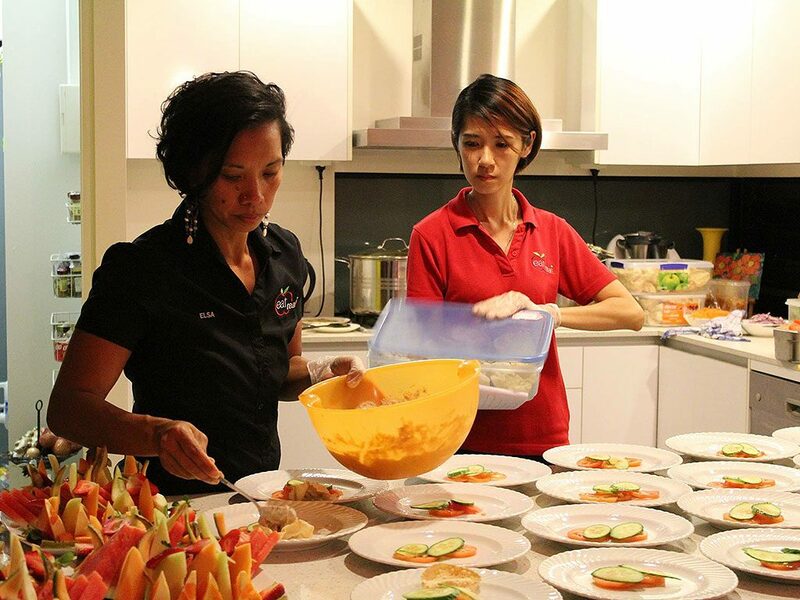 This Cairns healthy catering company can also come and prepare and/or deliver a range of meals and treats for special occasions, events and/or celebrations. 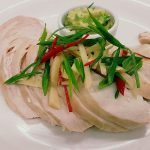 Some examples of what we can provide is below, which can be presented on individual dishes or on platters. 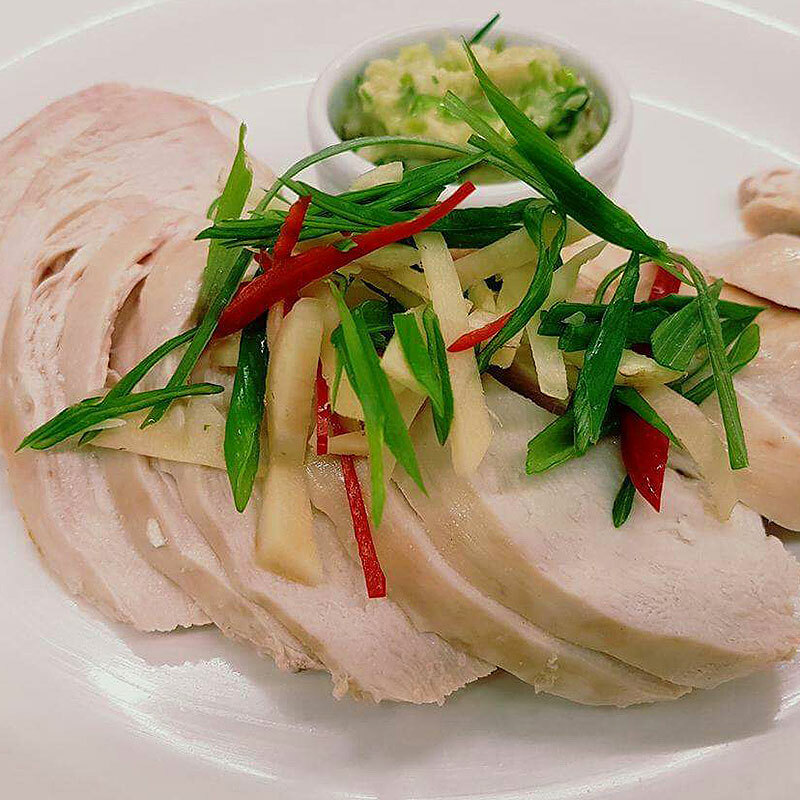 We’re happy to work with customers, creating a menu which suits your preferences and dietary requirements. Mini Sliders. 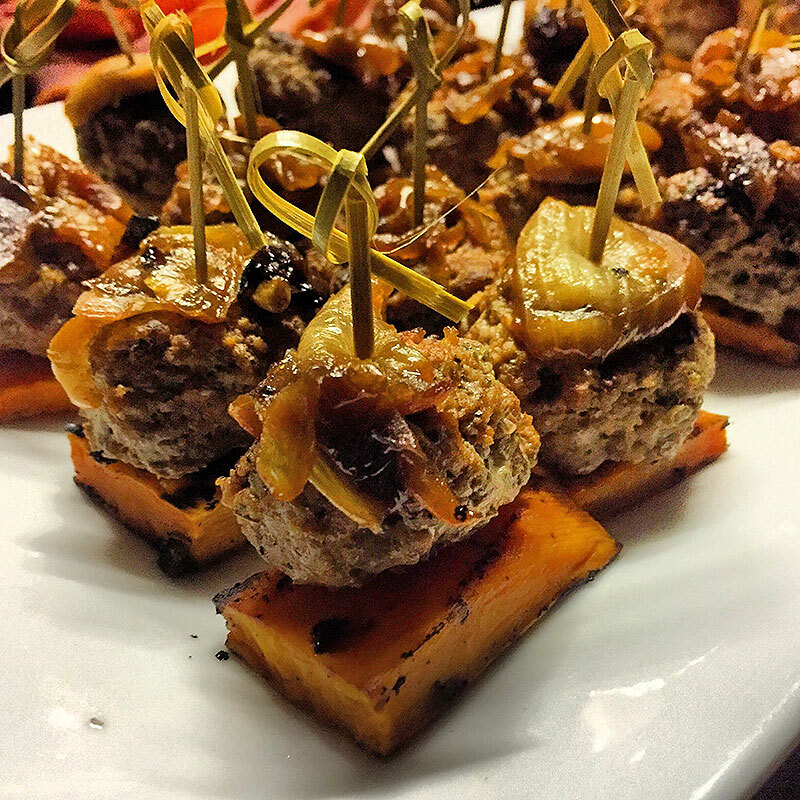 Sweet potato Rosti with Wagyu beef, caramelized onion with homemade BBQ sauce. Veggie Boat #1. 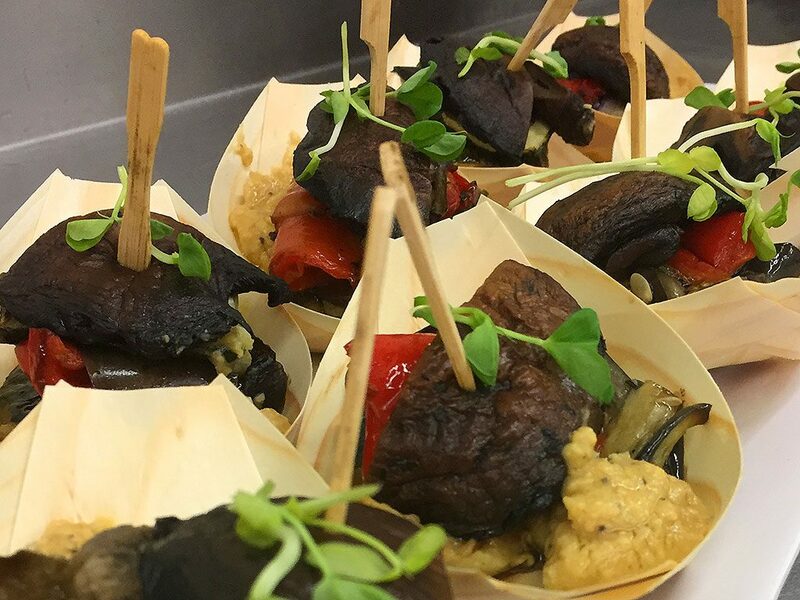 Mini vegetable stack on a bamboo stick with hummus dressing. Veggie Boat #2. Salt and pepper Tofu with a fresh Asian salad. Eat Real Boat #1. Rosemary lemon garlic crispy chicken with homemade dipping sauce. Eat Real Boat #2. Salt and pepper fish with pineapple salsa on Asian coleslaw. 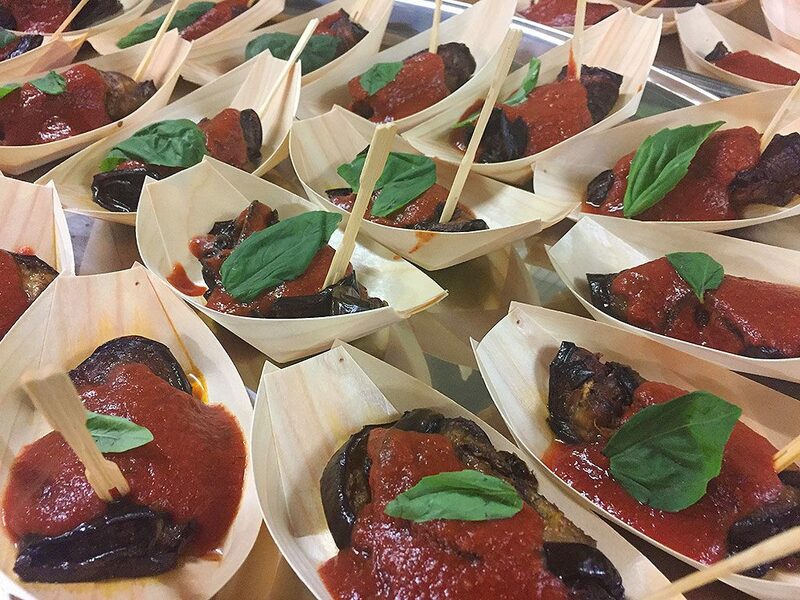 Mini Eggplant Cannelloni with rich tomato and basil sauce. Nachos: Mexican pulled pork with pineapple salsa and natural yoghurt. With or without cheese. Eggplant Dumpling. 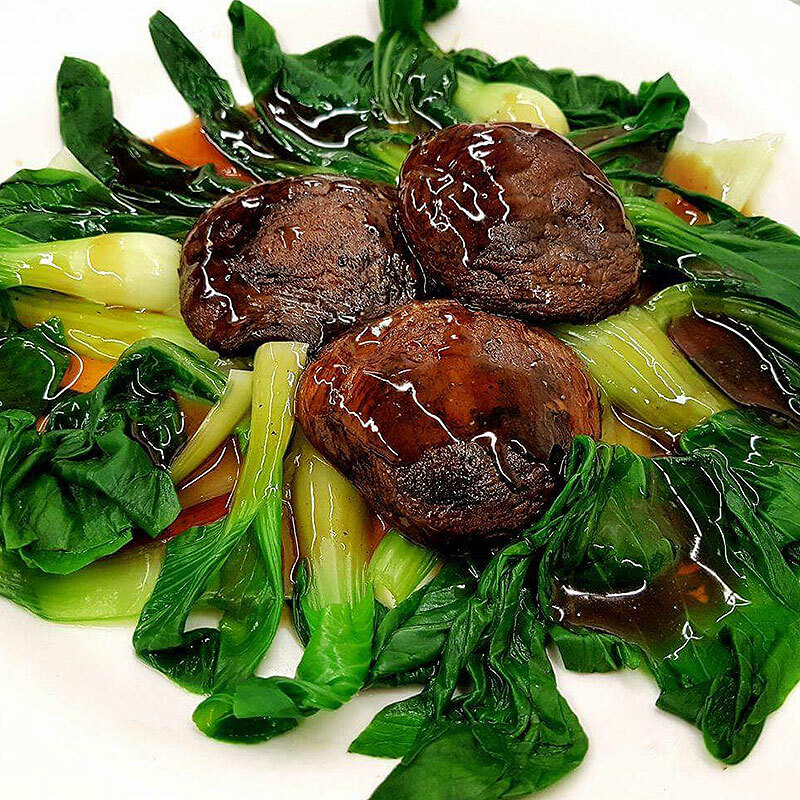 Our version of Chinese dumpling, using eggplant drizzled with homemade sauce. Mini Thai Boat. #1 Fish cakes with sweet chilli sauce. #2 Satay chicken with pawpaw salad. 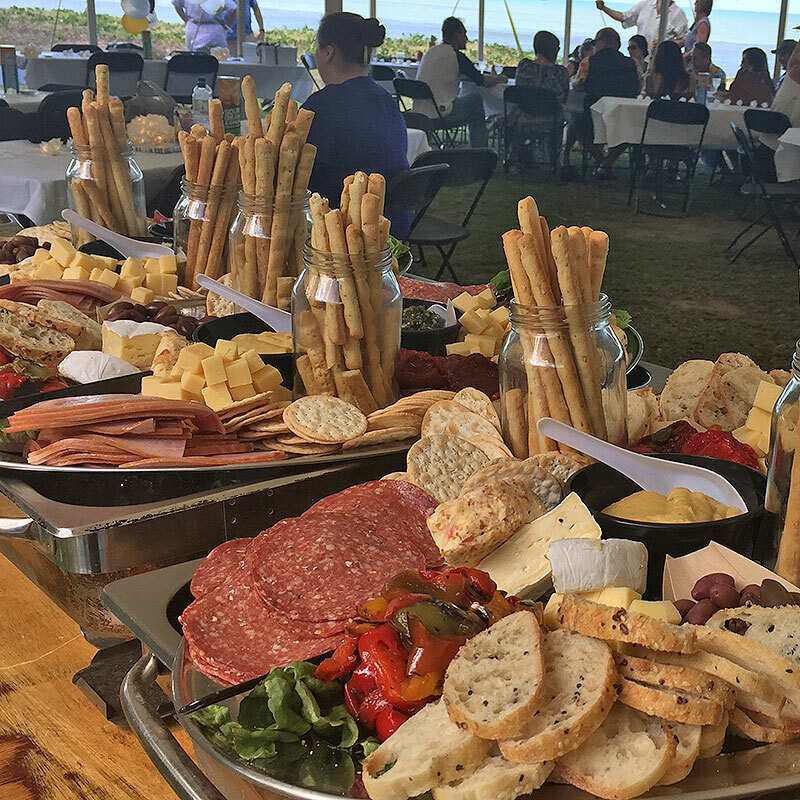 Prices are calculated on a per person rate, with a minimum of 10 people for catering purposes. Choose 2 items, $13.50pp | 3 items, $16pp | 4 items, $18.50pp | 5 items $22 per person. Add a mixed nut and fruit platter: Small $25 | Medium $35 | Large $45. Serviette, plastic plates / bowls (50c pp). 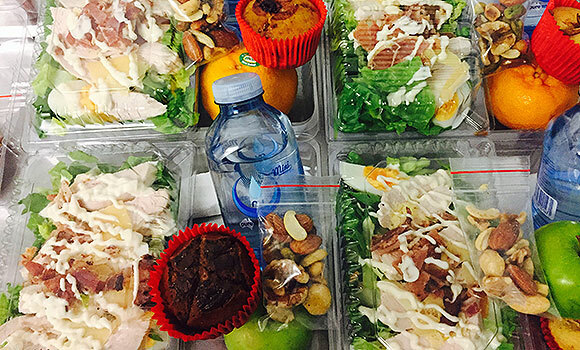 Platters can be collected or delivered around Cairns city for $30. 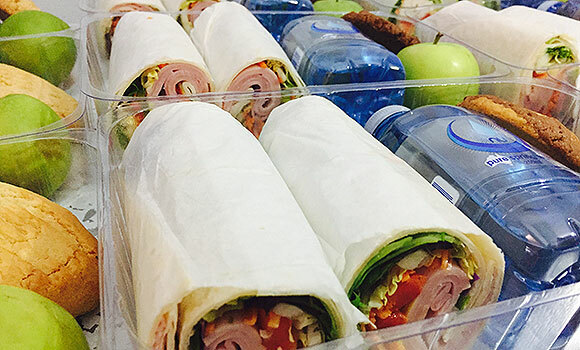 Download catering information. 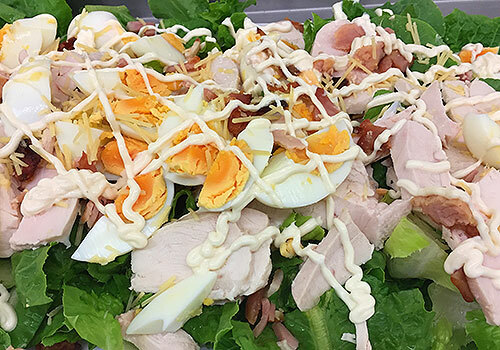 Chicken breast with crispy bacon, cos lettuce, free range eggs, parmesan cheese and homemade aioli. 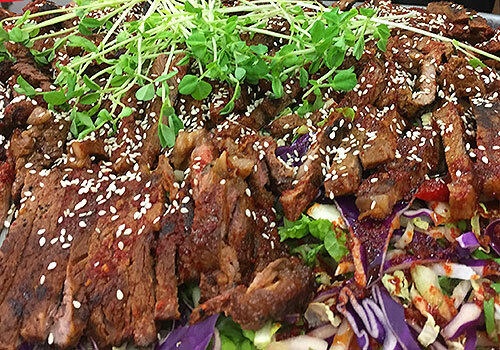 Rib fillet which has been marinated in Korean spice, cooked and cooled, served with fresh Asian salad. Broccoli, beans, brussel sprouts with peacan and raisins. Tastes as good as it looks. 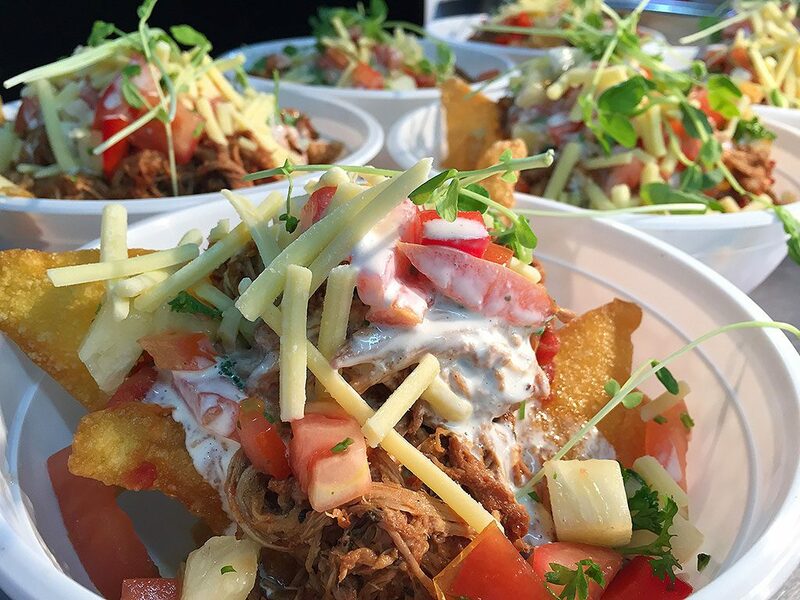 Wonton pulled pork nachos with fresh, pineapple salsa OR pulled pork served with coleslaw salad. Both delicious! 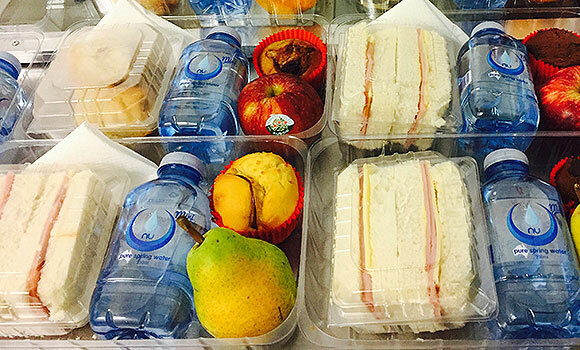 Making it easy to keep your event and/or meeting delegates healthy and happy, Eat Real are pleased to offer a range of meal packs. These are available for individuals, groups and large families. These need to be pre-ordered. 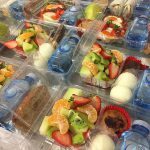 Below are some of the Meal Packs we can provide, yes we can customise. Contact Eat Real with any queries on 0416 229 412 or info@eatreal.net.au Download meal pack information.